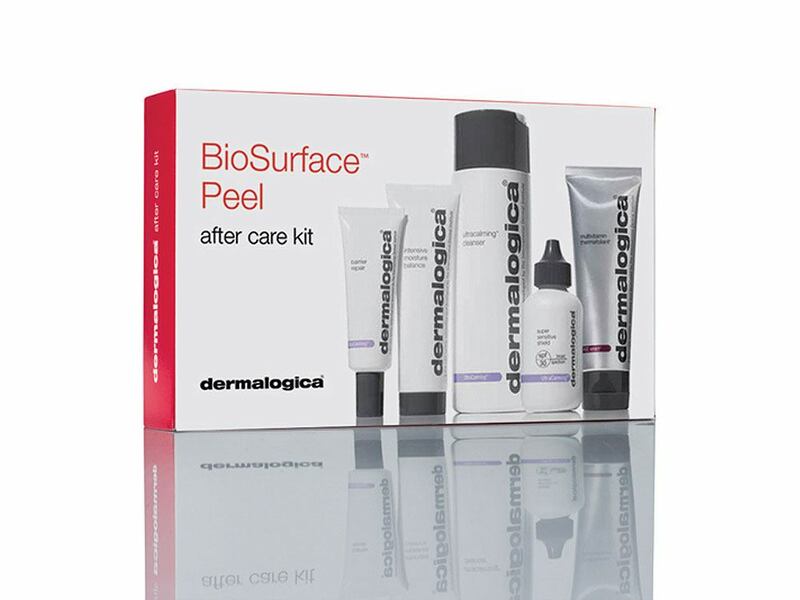 We have combined the BioSurface Peel Treatment with the new Dermalogica ExpertActive Treatments. The ExpertActive gives you unlimited personalisation combining the BioSurface Peel with the powerful IonActive Serums and high-quality equipment. Dermalogica’s BioSurface Skin Peel is a professional chemical peel designed to resurface the skin with minimal recovery time. Its unique multi-phase approach powerfully targets fine lines, hyperpigmentation and acne to take skin health to a whole new depth. No scarring. No downtime. The unique, multi-phase approach works with the skin’s biology to safely slough away dull epidermal layers and accelerate cell renewal without inflammation and prolonged downtime typically associated with chemical peels. BioSurface™ Skin Peel works in sequential steps with the exclusive Biosurface Peel Application Method to synergistically and safely decrease surface roughness, treat breakouts, reduce fine lines and help minimise the appearance of hyperpigmentation in the epidermis and dermal-epidermal interface. Prior to treatment you are required to receive a patch test. If a reaction was to occur that would happen within the first 20 minutes, however we suggest that at least 24 hours lapse from a patch test to ensure no contraindications will result. 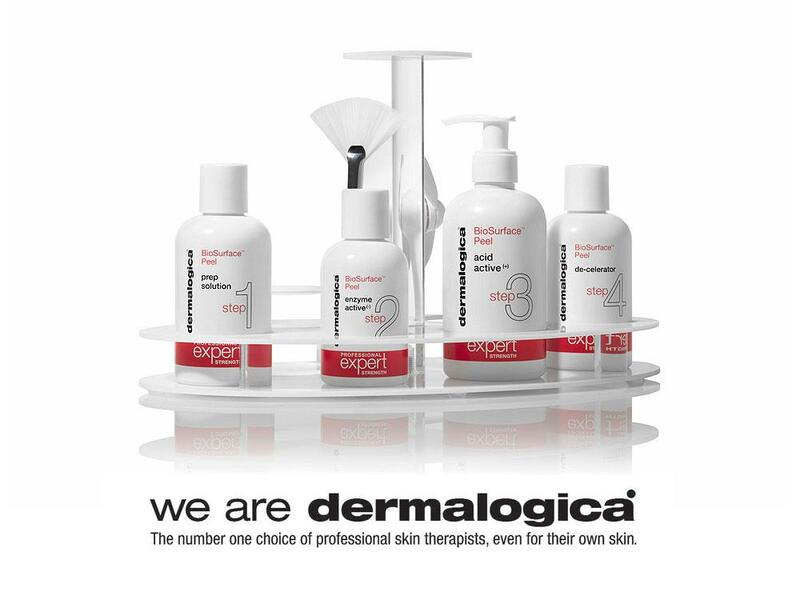 We recommend you should prepare the skin with key Dermalogica products 2 or more weeks prior to treatments. Prior usage will reduce any irritation or adverse reactions, and will yield the best results. Immediately after treatment; apply a broad spectrum physical suncream (minimum SPF30) such as Dermalogica Super Sensitive Shield SPF30 or UltraSensitive Tint SPF30. Avoid direct daylight exposure for 2-3 weeks and wear a 3″ wide brim hat if going in the sun is necessary. Direct sun exposure must be avoided to prevent hyperpigmentation. On the day of treatment; avoid strenuous exercise or prolonged exposure to heat sources such as dry saunas and steam rooms. Increased blood circulation to the face will cause an increased warming effect, which could lead to discomfort (prickling, itching, etc), redness, inflammation, swelling or other side effects. On the night of treatment; rinse your face with cool water and a gentle cleanser such as Ultracalming™ Cleanser, then moisturise skin with barrier-protecting moisturiser such as Barrier Repair. This will help soothe skin tightness. Increase your fluid intake for 2-3 days after the BioSurface™ Skin Peel treatment. Avoid using any type of exfoliation product on the treated area for 72 hours after treatment or until your skin shows no signs of sensitivity. If skin is no longer sensitive, Multivitamin Thermafoliant may be used to slough off peeling skin. Once peeling and redness subside; resume the regular Dermalogica daily routine that has been recommended by your professional skin therapist. If any of these contraindications are present the BioSurface Skin Peel cannot be performed. If the contraindication will clear within a few days or weeks the treatment can be rescheduled. Has received a cosmetic or resurfacing skin procedure such as laser, light therapy, chemical peel or microdermabrasion within the last 2 weeks. Has received Botox or other injectable procedures within the last 5 days. BiosSurface Skin Peel may be performed before injections or 1 week after injections. Has waxed an area on their face within the last 72 hours. Has received a professional exfoliation treatment (scrub, enzyme or Hydroxy Acid) or has used an exfoliating, Vitamin A-derived product or medication within the last 48 hours. The BioSurface peel application process consists of layers of biphasic, enzyme and acid peel solutions which are neutralised in the fourth and final step by using a foaming de-activator. Treatment time can be between 30 to 60 minutes.